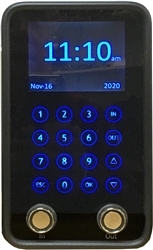 TimePilot Vetro is a state-of-the-art electronic timeclock with elegant touchscreen styling. Package includes 1 Vetro timeclock, 10 iButtons, 1 USB drive, power supply, software CD and Quick Start Guide. Tech support. All TimePilot timeclock systems come with 30 days of free telephone and email support. For an extra fee, you can purchase a full year of email and phone support. More iButtons. Vetro comes with 10; to add more employees to your system, just add more iButtons.